The Chippewa County Shooting Sports Committee is offering a basic course in muzzloader shooting on September 17-20. In addition to the workshop, a traditional Rendezvous shoot will be held on Saturday, September 19 with a special time block available for those interested in qualifying for nationals (NQE). Federal Premium Ammunition and CCI have just announced a .22 Ammunition Direct Sale Program available to youth shooting sports organizations across the country. Orders should be for teams and not individual shooters. For 4-H, this means each county must place their own order and may only place one order per county. For ordering information, please contact doug.thompson@ces.uwex.edu or terry.boehner@ces.uwex.edu. Certified leaders must work with their county Youth Development Educators to receive the proper authorization and must then be listed with the Youth Shooting Sports Alliance directory. Orders will be accepted from April 1 to April 15, 2015, only…..Orders after this date will not be considered. This ammo is specifically designated for youth programs. ABSOLUTELY NONE OF THIS AMMO IS TO BE SOLD OR USED OUTSIDE OF AN ORGANIZED YOUTH PROGRAM…IN OUR CASE, IT IS FOR OUR STATE OR YOUR COUNTY 4-H SHOOTING SPORTS PROGRAM. 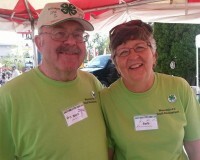 Barb and Norb Yogerst are offering wildlife workshops to county 4-H programs. Their workshops offer adult and youth leaders a complete curriculum with hands-on training and endless resources for setting up a county 4-H wildlife program. For more information, contact Barb or Norb Yogerst at 262-677-2379 or nbyogerst@gmail.com. Washington County leaders Norb and Barb Yogerst were inducted in the inaugural Wisconsin 4-H Hall of Fame on November 15, 2014. Known for their involvement in the Wisconsin 4-H Shooting Sports program, both are nationally certified Shooting Sports Trainers who have travelled throughout Wisconsin to help county volunteers and staff start shooting sports programs while weaving in environmental education throughout. They have helped start or enhance 15-20 counties’ Shooting Sports programs. Congratulations, Norb and Barb!